I would like to introduce a couple of desserts that I have made with SOBA-CHA (Buckwheat Grain). At first, it was little difficult for me to get an idea of a sweet dish using SOBA-CHA (Buckwheat Grain), because I have never heard of a sweet dessert made from SOBA-CHA (Buckwheat Grain). That was going to be a challenge for me, especially since American's taste in desserts is a bit different than the Japanese taste, and the aroma and flavor is quite strong for most American's, my husband believes. So, first I milled the Buckwheat to a very fine grain like flour, which I thought can be mixed with regular flour for baking desserts. You may want to be careful with the proportion of Buckwheat to Flour mixture, using two(2) tablespoons of Buckwheat per one(1) cup of Flour will allow for a nice sweet dessert with a nice pleasant Buckwheat flavor. Adding more Buckwheat will enhance the flavor and texture of the dessert depending on how much you enjoy the flavor of Buckwheat. At first I made some muffins, which I think is a very popular dessert type of snack in the U.S.... Am I right? 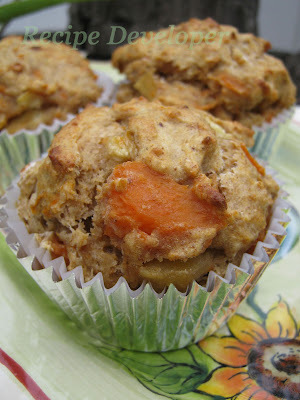 Some ingredients that I put in the muffin mixture are apples, bananas, and a yam in it. I cooked the apples and yam until they were nice and tender, then I added the bananas. I chose these three(3) ingredients because these are what I usually have handy at home most of the time, but I think it turned out pretty good! 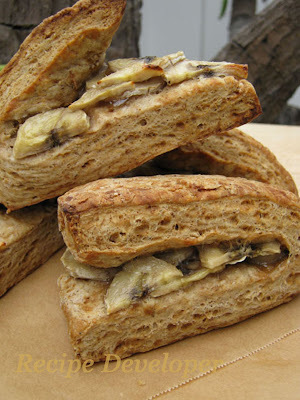 And, this biscuit is made with milled Buckwheat Tea (SOBA-CHA), and sliced banana inside. This was so easy to make and took just a few ingredients. The aroma that filled the kitchen while I made this dessert was wonderful and I loved it. It was fun to make those sweets, and I was happy to be able to make a couple of desserts with the Buckwheat. I do plan on baking more desserts incorporating Buckwheat into the recipe, and hoping to find that special mixture of fruits and spices when combined will make an tasty dessert.